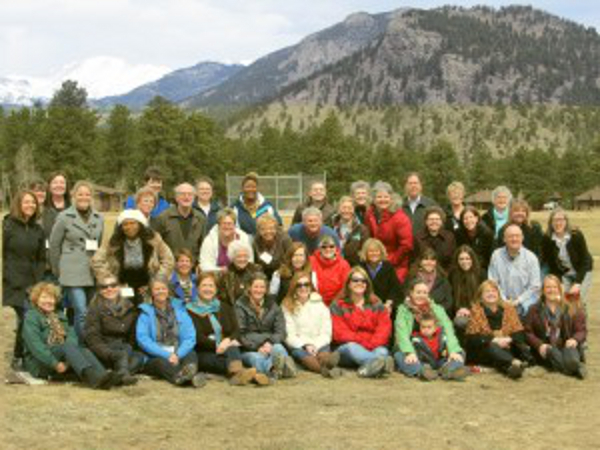 The YMCA of the Rockies provided the idyllic setting for 45 Free Methodists who gathered April 11–14 for the Wesleyan Holiness Women Clergy (WHWC) event Come to the Water. This year’s theme, “Rise Up,” threaded throughout the event in the worship and speaking. Just walking outside between sessions lent reality to the theme as participants gazed at mountain peaks rising up toward heaven. On Sunday morning, Free Methodist Gateway Conference Superintendent Lucia Delamarter preached on “Run With the Spirit,” telling us to “get in, sit down, shut up and hang on.” She ended by encouraging those who desired to pick up the rock they had laid down and find that burden lighter and different than when they gave it to God. Delamarter serves on the WHWC board and has assumed the presidency of this group for the coming term. Free Methodist livelihood ministry SEED provided beautiful bead necklaces to use as lanyards for the event. As each woman registered, she chose a necklace to wear with her nametag and to keep as a gift from SEED. Rose Brewer and Tasha Pryor brought a full display of SEED products to spread the word about opportunities to support livelihood groups around the world. Linda Adams provided a booth about International Child Care Ministries with opportunities to sponsor children. Come to the Water will reconvene in two years, offering yet another opportunity of encouragement for women clergy.